Pat Repanich grew up on Bainbridge Island, class of 1957, graduated from WSU, and taught elementary school in Moses Lake and Mattawa. 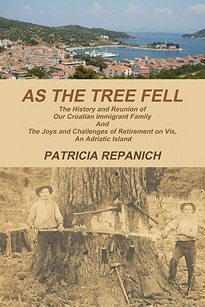 Her book As the Tree Fell (2012) chronicles the search for her husband’s ancestral roots in Croatia. The inquiries soon lead to the discovery of Croatian relatives who live on the beautiful island of Vis. The book provides a picture of two families - one in the US, the other in Croatia - and how the parallels and differences in their experiences express the emotions of relatives who are forced to separate and live life in two very different worlds. Upon retirement, the American Repanich family decided to purchase a fixer-upper seaside villa on Vis where they now enjoy their retired life. Pat Repanich says that the experiences of living in a different culture are at times very challenging but most often joyful, and full of humor. She loves all the challenges and is happy to be able to share her experiences with her readers.